This morning I was feeling a bit generous, so I offered theHubby a choice of pancakes or waffles for breakfast instead of the usual nothing (not that I'm mean, but he usually waits until mid-morning for something to eat, long after I leave for work). After he chose pancakes (Yay ... less work!) I went to the pantry and discovered that the pancake syrup I thought was hiding behind the oatmeal box was so good at hiding that I couldn't find it. 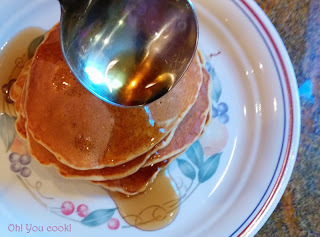 Not too worried, I assumed that the non-high-fructose corn syrup in the pantry, along with some other magical ingredient or two could sub for the real" high-fructose corn syrup-based imitation maple pancake syrup. 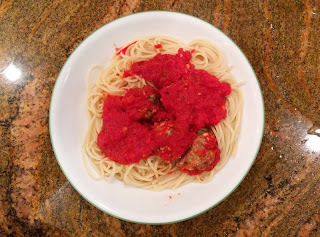 I want to take a break from all the candy recipes post a dinner suggestion instead ... meatballs! Nothing says comfort food like spaghetti and meatballs. Especially on a yucky, kinda lukewarm and humid rainy day, such as today. Not so hot that turning on the oven will roast the entire house, but not so cold that you need a real substantial hot meal. Today practically screams for spaghetti and meatballs. Spaghetti is spaghetti. Use regular spaghetti, or use thin spaghetti (spaghettini, in case you buy pretentious pasta). I like thin spaghetti because it fools me into thinking that there's more pasta in the box. Which there is, if you go by the number of strands in the package.